Dark Horse submission advice, and an update. Podcast interview coming up, post your questions! Artists Alley list for Comic-Con in San Diego! Seven page TAG preview at Newsarama! 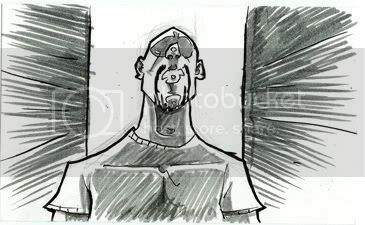 I've always wanted to test my hand at storyboarding for a motion picture (since comics are essentially the same artform), and it just so happened, about four or five months ago, director Donny Broussard tapped me to do some storyboard work for his upcoming indy film Wide Asleep. Having known him for a while now, and knowing that the guy's incredibly proactive career approach had served his budding film-making career very well, I jumped at the chance. It was a helluva job for me to pump out around 150 storyboards, but I took it as a challenge. Speed without losing quality has always been a challenge, so this was a great exercise. In the end, I'm really glad that I did them and am looking forward to seeing Donny and the Bigfoot Productions guys put them to film. Here are a few rough peeks at the storyboard sketches. Check for any other updates as well as other art in my blog.